Reason for Reading: Buddy Read with Carl from Stainless Steel Droppings. From the Pulitzer Prize-winning author of Martin Dressler comes a stunningly original new book set in a Connecticut town over one incredible summer night. The delicious cast of characters includes a band of teenage girls who break into homes and simply leave notes reading "We Are Your Daughters," a young woman who meets a phantom lover on the tree swing in her back yard, a beautiful mannequin who steps down from her department store window, and all the dolls "no longer believed in," left abandoned in the attic, who magically come to life. With each new book, Steven Millhauser radically stretches not only the limits of fiction but also of his seemingly limitless abilities. 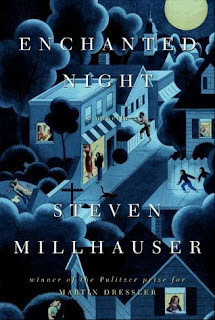 Enchanted Night is a remarkable piece of fiction, a compact tale of loneliness and desire that is as hypnotic and rich as the language Millhauser uses to weave it. Following our buddy read of the Charles de Lint collection, The Best of Charles de Lint, there was some discussion on what we should read next. We decided on Dune, which I have since given up on, and Carl really wanted to reread Enchanted Night. Normally I will not splurge and buy novellas because I read them too fast, but both Carl and Chris have written positive reviews of this book. I am happy that I splurged because this book had so much going on and is easily a book you can read again and again. Carl asked the questions about the book because this was a reread for him. You can read my answers below and visit his blog to read his answers to the same questions. 1. The story takes place over the course of one night with a cast of characters who are obviously night owls. Are you a night owl/can you relate? Have any moonlit night adventures of your own? I am very much a night owl. I stay up way too late the majority of the time and most of my life takes places at night. I can definitely relate to the people in this book for that aspect. I remember when I was a young teen and was always trying to do the right thing and go to bed at a decent hour. I always felt guilty for staying up late, but it just seemed to come naturally. Since I stay up late regularly, most of my adventures take place at night. I am just not sure mine are quite like the ones addressed in the book. 2. How did the structure of the novella work for you, brief snippets of story intertwined and woven together into a whole? If I read a collection of short stories I prefer this type of format. One of my biggest problems with short stories is that I am always left wishing for more. With books like this, you feel like you are getting more because everything is interconnected and story-lines are developed more. I didn't read the backs of books, so I wasn't even entirely sure that is what was happening until I got going with the book and then I was really happy about the idea. 3. Which characters stood out to you and why? Did you relate to or like any characters in particular? Are there any of the story lines that you didn't care for? None of the story-lines really bothered me in the sense that I didn't want them included, but the idea of a 'peeping Tom' sort of bothers me. It's just creepy and something I am not too eager to experience. Since your post is up all ready, I have been flipping back and forth between my typing and your answers. I have to agree with you about Haverstraw. I can relate to the idea that dreams and your life are passing you by. As I get older I notice a lot more how quickly time flies. It freaks me out that I won't accomplish everything that I am meant to accomplish because time is so limited. I enjoyed the idea of the teenage daughters who broke into homes just to leave a message saying: "We Are Your Daughters". I believe there is a lot of deeper meaning behind this story arch. Most notably, though, I enjoyed the idea of the neglected dolls awakening. This is just a thought from my childhood when I really thought that when I left the room my toys came alive. 4. When you were a teenager would you have wanted to be one of the 'daughters' who was breaking into houses? As an adult would you want to have your house broken in to? I am not sure. I think I would have to actually reread the book because my understanding was that these girls, for whatever reason, were feeling neglected and needed the attention of strangers. It meant more than that to me, though. It made me think about reputations and gossip and how things can get a bit out of hand so people need to be reminded that these young women could easily be their daughters. I might be reading too much into the story, but that was what it left me thinking about. Then, someone actually takes time to appreciate them. I enjoyed that because I know how hard it is to be a teenage girl. I am not sure I could do it, but I can relate to idea. As Carl mentions in his answer, it is also about gender roles, too. 5. The woman who lives alone chooses a special name for herself. What would your special name be? When I read this question I was thinking about the conversation I had with Carl on a previous post about whether or not Pluto is a planet or a planetoid. I was thinking that Pluto Worshiper would work well for him. Funny, he never thought of that himself. I guess he is not as loyal to Pluto as he thought... Sorry, couldn't resist... Moving on... I have never been one for nicknames. I know, that sounds strange because I go by Kailana on my blog, but that was never meant to be a nickname. 6. How would you classify this novella, genre-wise, and do you find yourself making any comparisons to other authors/stories? My copy of the book states that it is Fiction/Literature. This is one of those books that I would never want to have to shelf. There is many different genres represented. I was thinking of Gabriel Garcia Marquez while reading this book. He also takes simple things and mixes in a lot genres. That being said, it has been ages since I read anything my Marquez, so it could be entirely different if I had read him recently. 7. How did you find the experience of reading this in one go on a moonlit summer night? It was the perfect setting for reading the book because the book takes place on a summer night. I was happy that the weather was nice and you could actually see the moon while I was reading it. I think when I reread it I will have to make sure it is also a nice summer night. 8. What other thoughts do you have that you want to share about the book? I loved the cover... It bothers me when covers are poor representations of the book. This cover actually shows that someone read the book before putting it together. It is such a nice cover that I am thinking of devising a way to have it so the cover faces out on my shelves. I guess I should have bought this book back when Chris' review appealed to me because I was so happy to read it! That being said, this was a fun way to experience it and I recommend it to all for some night-time, moonlit, summer reading. Of course I was a nervous wreck all of Friday night wondering just what you were thinking of the book. You didn't jump on Twitter or anything to give me any clues and I just knew I would be super disappointed if you didn't love this book. I actually told my wife and daughter Friday morning that we could plan to watch movies or whatever together until it got dark, but once darkness fell I was cracking open Enchanted Night because I was reading it somewhat simultaneously with a friend. It was fun knowing (assuming) you were reading the book too. I don't think you are reading too much into the daughter's story at all. I think all of these stories have HUGE layers of meaning and could be interpreted a number of different ways and be right. I was thinking that this would be a great book to be discussing with the Dune group because they really like to do the back and forth thing. I certainly think the daughters are trying to fulfill some deeper need and not just doing this on a lark. There doesn't seem to be much particularly happy or silly about what they are doing. Contrasted with the boys breaking into the library just to hang out and shoot the breeze, the girls seem to be very somber and purposeful. Not sure if it is a cry for help or just a way to be noticed and get some attention even if it is a deflected sort. At any rate I think there is a lot going on in that story. I also really like the toys coming alive, but I felt I had already gone on long enough with that question and needed to stop. I have never let go of that childish joy or pretending/believing that your toys are alive and that they come alive both with you and possibly when you are asleep or are gone. The Toy Story movies are so enjoyable to many adults for that very reason. I like that this night was so particularly magical that the toys couldn't help but come alive. One thing neither of us talked about was the Pied Piper type character. Did you find him creepy or kind or somewhere in between? I think this is such a great story structure just because of what you point out. It feels like you are reading a series of short stories but they are so masterfully interwoven into the whole story. I could be the Pluto Prostlytizer! I like it. And I do believe!!! I am right with you on the cover of this book. I'm not sure what style that art is but I've seen various artists work in a similar style and I like it very much. And this is so perfect because it was created by someone with an intimate knowledge of the story. I have been mulling an idea around that I need to talk to my woodworking dad about. I would like to build a series of shadow box type frames that would have some kind of gentle mechanism that would hold a book tightly and upright without damaging it, so that I could have a series of frames hung up that I could house books in and use them as interchangeable pieces of art. Your comments make me even more determined to see what we can do. Thank you so very much for doing this with me. We'll have to start thinking about our next buddy read. I'm looking forward to Way of Kings and I'm starting to think about some (much shorter) book to group read for RIP. Maybe I was trying to get my head around the daughters through my own experiences being that age... I wanted them to have a higher purpose to something that seemed a bit random. I totally forgot to mention the Pied Piper. I had planned to because I was glancing at the cover and saw him, but when it came time to comment I entirely forgot. Probably somewhere in between... I also thought that when I read about the Pied Piper. Thanks to you for suggesting this book. Since my library didn't have it, I am not sure if I ever would have gotten around to it... I am a lot picker with book purchases than I used to be. I am looking forward to Way of Kings, too, and to more buddy reads in the future! This sounds really good and I just adore the cover! I tend to side with you in thinking there is much more than meets the eye when it comes to the daughters. I was really afraid the first time that something bad was going to happen with the kids and the pied piper but then when nothing did I was relieved and so over the last couple of reads I have started to drift more towards maybe him not being so bad. Then again how can you be good at all if you are luring young kids out of their homes in the dead of night with music. LOL! Don't the toys come alive in the Nutcracker Suite? I have some vague memories of seeing a cartoon version of it when I was a kid and for some reason I am thinking that happens. Of course I could be way off. If we can somehow figure out this picture/book thing I'll definitely let you in on the secret and post some snaps. And yet more of a reason in my mind to consider Pluto a planet, "science" be damned. After all, we only have ONE moon! **bermudaonion: The cover is great! **Carl: oops, I read this, but I didn't reply... I thought something bad was going to happen with the piper and kids, too! I imagine it will be different when I read it again... Maybe the Nutcracker Suite, but that's not the movie I am thinking about. I think the main character was a rabbit? **animewookie: Thanks! I love the cover too!! The only thing I can think of right now with a rabbit toy being "alive" is The Miraculous Journey of Edward Tulane by Kate DiCamillo. I'm sure that isn't what you are thinking of, but any avenue that presents itself to give this book a shout out is one I will happily take. **Carl: Yeah, that's not it. I have read that book, though, and it was really good!